The magic of Star Wars is twofold. There is the wonder of the stories that unfold onscreen, from epic space battles to elegant lightsaber duels, and then there is the fantastical background of how Star Wars comes into existence behind the screen. For some, peering behind the curtain ruins the magic, but for those who enjoy learning about the process by which our cinematic joys take form, The Art of Star Wars: The Force Awakens is an exploration which absolutely should be taken. Written by Phil Szostak, The Art of Star Wars: The Force Awakens is a beautiful illustrated 250+ page journey through the production of Star Wars’s seventh episode. Featuring the art of Lucasfilm’s present generation of great artists, such as Doug Chiang, James Clyne, and many, many more, the reader is offered the opportunity to follow how the visual and storytelling ideas of The Force Awakens unfolded over the course of its making, from germ to final product. This is done with hundreds of pieces of art curated from undoubtedly thousands produced in the course of the film’s creation, often accompanied by quotes from the artists themselves, describing the circumstances and why of the art’s inception. Szostak accompanies these tidbits as a narrator leading the reader down the production timeline, introducing new artists and creatives who joined the Lucasfilm team. With the insight given by the artists themselves, the reader is also given a new prism through which to understand and appreciate the visual world of Star Wars, be it a reliance on the basic shapes of starships to architectural styles that accompany a specific element of the franchise. In a way, the process the artists undertook to develop The Force Awakens represents a streamlined critique of George Lucas’ and Ralph McQuarrie’s vision of the galaxy far, far away. As a result, the reader is left with not just an understanding of The Force Awakens, but also of the two trilogies which preceded it. That’s not to say that nothing interesting is learned about J.J. Abrams’ film, either. 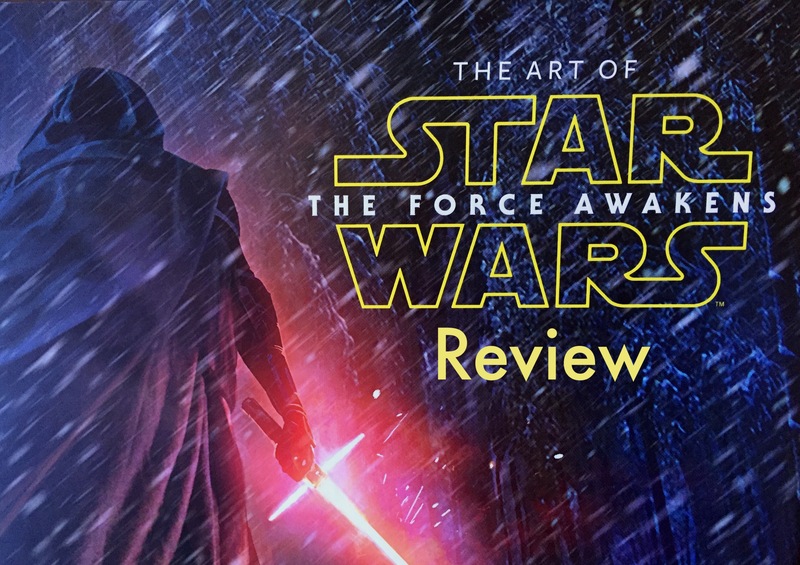 The story of The Art of Star Wars: The Force Awakens, is after all, about The Force Awakens. 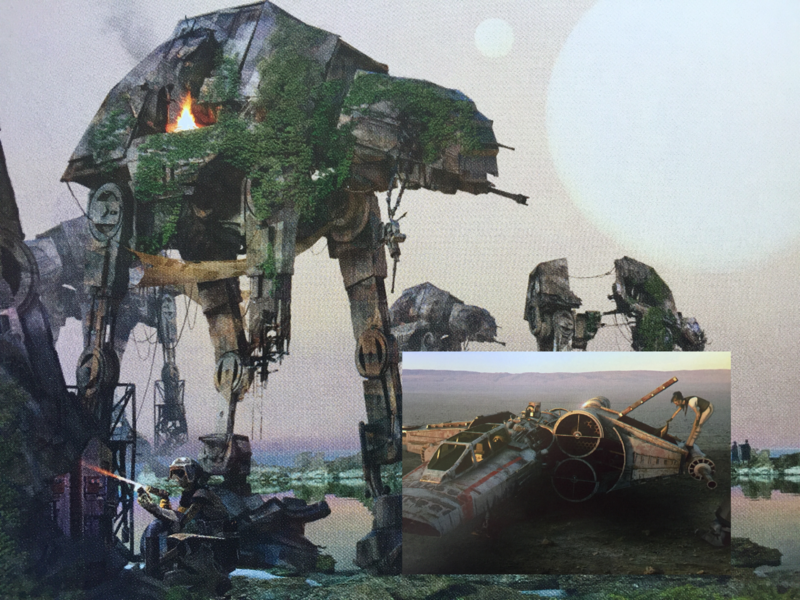 Surprising shifts in settings and characters are revealed in production art that eventually became orphaned by storytelling decisions, such as Rey originally living on a swamp-like planet instead of desert covered Jakku, or that some thought had been made to make the antagonist a female Twi’lek instead of Kylo Ren. Even Rey’s name is revealed to be a late addition to the story of The Force Awakens, as the world came very close to seeing tons of girls dressing up as Kira for Halloween in an alternative timeline. Perhaps the most interesting aspect of the what-ifs of the production process is the manner in which ideas can be discarded, but not forgotten. The red masked Guavian Death Gang members? Their design began life as a potential look for the early antagonist known as ‘the Jedi Killer.’ Likewise, in a case of being carried over into the future, an “exotic city” painting by concept artist Yanick Dusseault based on work by Ralph McQuarrie bears a striking similarity to sets built for Episode VIII. For a history of The Force Awakens illustrated in concept and imagination, The Art of Star Wars: The Force Awakens is a must read for those interested in the production side of Star Wars filmmaking. For those who simply love art set in the Star Wars universe or science fiction in general, the volume should be one which would bring pleasure page after page. When the credits role at the end of a film with hundreds of names quickly appearing and disappearing from the screen, The Art of Star Wars: The Force Awakens captures a fraction of those names, and embellishes the understanding of the role those individuals played in creating the sequel to Return of the Jedi. That role was immense and it’s definitely worth any fan of the film’s time to pick up The Art of Star Wars: The Force Awakens and reflect upon the illustrative magic that flowed from their fingertips. This sounds awesome. Especially how you mention that the story evolved over time, with various competing conceptions. One of my prized possessions is the Ralph McQuarrie (I probably misspelled that) Star Wars portfolio, that had these beautiful painted concept art for the first Star Wars movie, with Stormtroopers carrying light sabers, a female Luke Skywalker, etc. I knew that the script received a lot of work, but it was fascinating to see those changes happen through the art. That McQuarrie portfolio sounds very nice! It’s pretty cool. I need to see if I can find it in my basement where I put all of my priceless treasures.